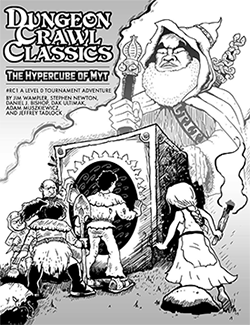 This week our four judges take a look at the Halfling class in DCC RPG. From the halfling’s race-as-class abilities as party luck battery to two-weapon fighting to sneaking and hiding, we cover it all – even the sensitive subject of halfling manscaping! Sorry for the late post; I’m still getting caught up on Spellburns. Player Bob is right on the money. The autohit for halflings makes the high end favorable. I tend to think in terms of “Adjusted AC” where AdjAC = AC – hit bonus. In that case, 1d20 is favorable for 13< AdjAC <19, which is identical to what Player Bob said. Also the spreadsheet says "Formula = Probability of Miss + (Probability of Miss * Probability of Hit)". The first term should be the probability to hit, i.e., "Formula = Probability of Hit + (Probability of Miss * Probability of Hit)". Hope that helps and thanks for the great podcast! As for the halfling with two slings, I wouldn’t personally allow it as such, but I might allow him to sling two stones in the same 10 seconds with a single sling. The question about the extra Action Die was interesting. I would rule it could be an extra attack, but not an extra two. So, the halfling might roll d16/d16/d14, and then later d16/d16/d16 and d20/d16/d16. I sent you an email with the Wampler…..Did you get it? Yet another great show. Jen is a great addition to the show! I think I would allow them to get 2 attacks per action die so at level 6… either d20/d14 or d16+d16/d12+12. It sounds like a lot, but considering what other classes are able to do at 6th level (wizards, clerics, and elves (or is that elfs) are casting 3rd level spells by then) I don’t think it is necessarily broken. I would guess that by level 6, most ACs that the characters would run into are going to average around AC21, so rolling a d12 to hit… well… perhaps just pray for the critical on the d12s. HA! Excellent episode. Halflings…useful in both combat and for a meal if you run out of supplies. Remember, save the toes for last…they are delicious!!! Good show. The shows with in-depth information about the mechanics of DCC and your experiences running games are my favorite. I’m looking forward to an episode on Clerics. Another great podcast. I have to agree with Jim, in that I’ve never wanted to play a halfling in all my ancient years of gaming. This is the first time I’ve ever thought it would be cool to play one, and it’s because of the angle Joseph took with them. Keep up the good work, and Jen is a great addition to the recipe!! It is a tradition that we cannot get a new podcast until the Four Js have reduced me to begging. Heh! Heh! NTRPG and Origins have done a number on scheduling!